On 11 August 2011 The National Archives opened 34 formerly secret Ministry of Defence UFO files. The files can be downloaded from the TNA’s UFO page here, along with a highlights guide and a podcast summarising the key stories. This is my personal summary of the highlights from the eighth, and possibly the penultimate, release of this disclosure programme. In my opinion these papers provide the most detailed and revealing insight into British government UFO policy in the decade before the closure of the MoD’s UFO desk in 2009. One snowy night in 27 January 2004 Alex Birch took a series of colour slides showing Retford Town Hall for submission to a photography competition. He saw nothing unusual at the time. But on examining the transparencies he was amazed to find an image showing what appears to be a classic “flying saucer” (DEFE 24/2060/1, p125-141). Having ruled out lens flares and aircraft he contacted the Ministry of Defence. They said “defence experts” would like to take a closer look at the mysterious “elliptical object” visible on the transparency. He delivered the slide to the MoD Main Building and it was sent to the Defence Geographic and Imagery Intelligence Agency (also known as JARIC ) for computer analysis. After subjecting the image to detailed scrutiny DGIA said they were unable to reach any “definitive conclusion” about the mysterious image. Even more bizarre is the fact that this was not the first time the Ministry had been left perplexed by a photo taken by Alex. He first made headlines in 1962 when, as a 14 year old schoolboy, he took a black and white photograph showing a fleet of “flying saucers” over Sheffield. The photo caused such a furore that Alex and his father were invited to visit Whitehall, where the image and Alex’s Box Brownie camera were examined by Air Ministry experts. 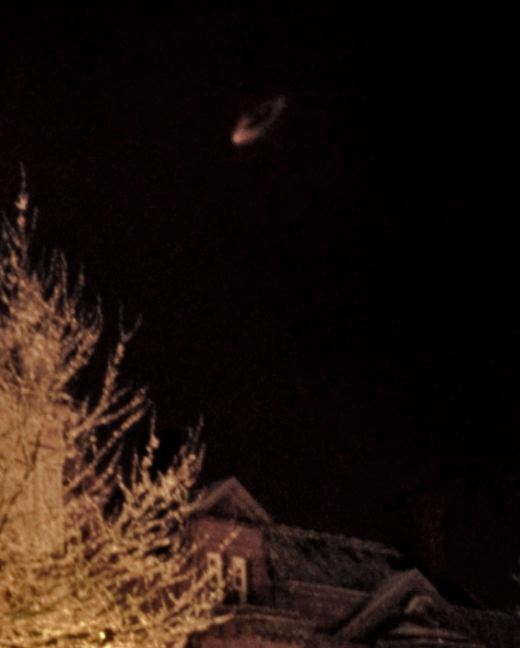 The full story can be followed on my Case Files pages (Alex Birch UFO photos). There are some other examples of MoD calling upon image intelligence experts to help them evaluate UFO photos. In 1992 colour photographs showing a unidentified diamond-shaped object were taken by a member of the public at Calvine in Scotland. The photographs show the object apparently shadowed by a RAF Harrier jet and desk officers suspected iit could have been a USAF black project aircraft. The images were sent by DI55 to JARIC for detailed scrutiny and disappeared. MoD claim there are no surviving records of their conclusions. This type of covert work triggered a sharp exchange of views within the Ministry. In public MoD policy was they did not spend public money on UFO research. But in private desk officers at the Defence Intelligence staff were keen to take a look at photos and films of UFOs obtained by members of the public. In order to do so, UFO desk officers would need authorisation to approach members of the public by phone or a personal visit. This was seen as a risky public relations strategy. 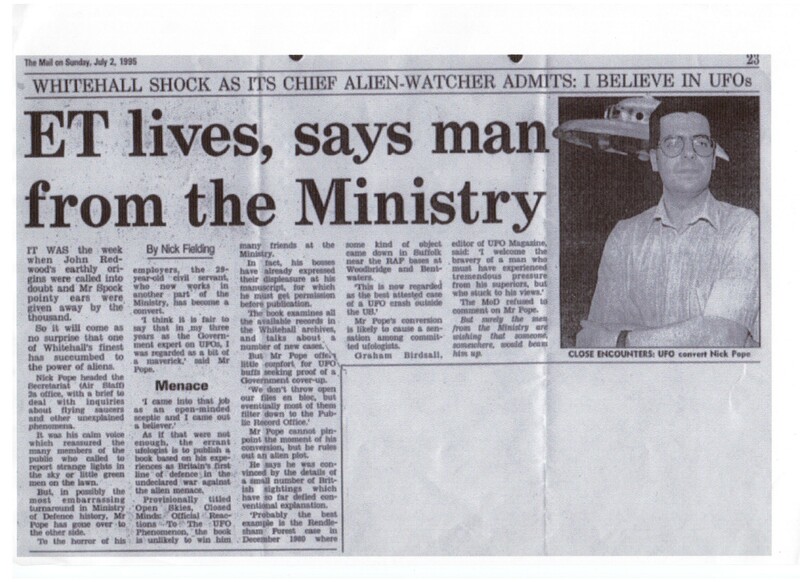 They were well aware that both the Press and UFOlogists would interpret any interest, let alone personal visits from “the men from the Ministry”, as proof that MoD were involved in secret research on this subject. This conflict was never resolved and the files prove that it paralysed all attempts by individuals within MoD to make any sense of the the UFO data available to the British government. Similar problems bedevilled attempts to use public money to put details of the sightings received by the Ministry onto a computer database. One early attempt to use a computer to study UFOs in 1987 was halted after senior officials “decreed that all work should cease as it was in contravention of Ministerial statements to the effect that UFOs did not pose a threat to the UK”. But the idea was revived in 1993 when a limited study was proposed by DI55, despite the “potential for political embarrassment” if news leaked out. In the MoD UFO policy file DEFE 24/1958/1 (pg 32) you can read what I believe is the most significant document released so far. 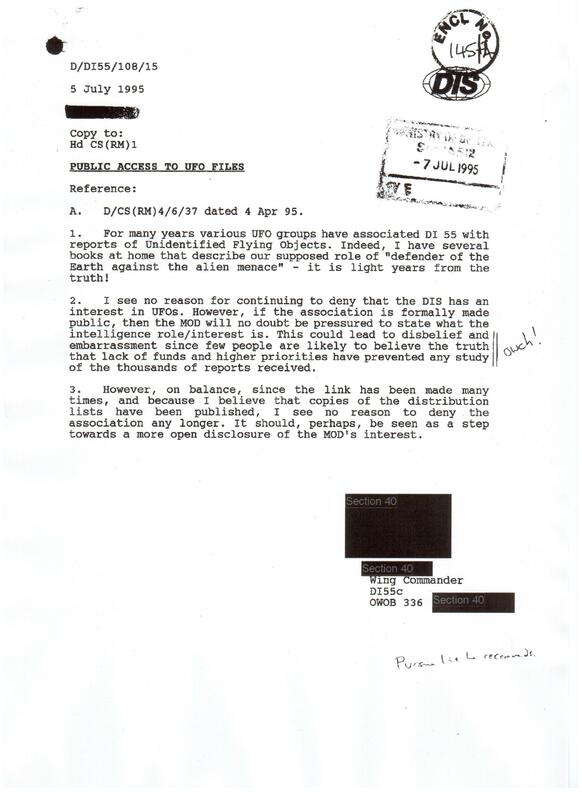 It is an internal memo from DI55 Wing Commander dated 5 July 1995 which says there is no reason to continue to publicly deny intelligence interest in UFOs. It notes press stories have described DI55’s role as “defender of the Earth against the alien menace” but says this is “light years from the truth.” But significantly, the Wing Commander feared that if this interest was revealed publicly it could lead to “disbelief and embarrassment since few people will believe the truth that lack of funds and higher priorities have prevented any study of the thousands of reports received.” Another official has scribbled “Ouch!” in the margin of the document. “…sightings can be explained as mis-reporting of man-made vehicles, natural but not unusual phenomena and natural but relatively rare and not completely understood phenomena”. Following completion of the report, it was decided no further work on UFOs would be carried out by Defence Intelligence. 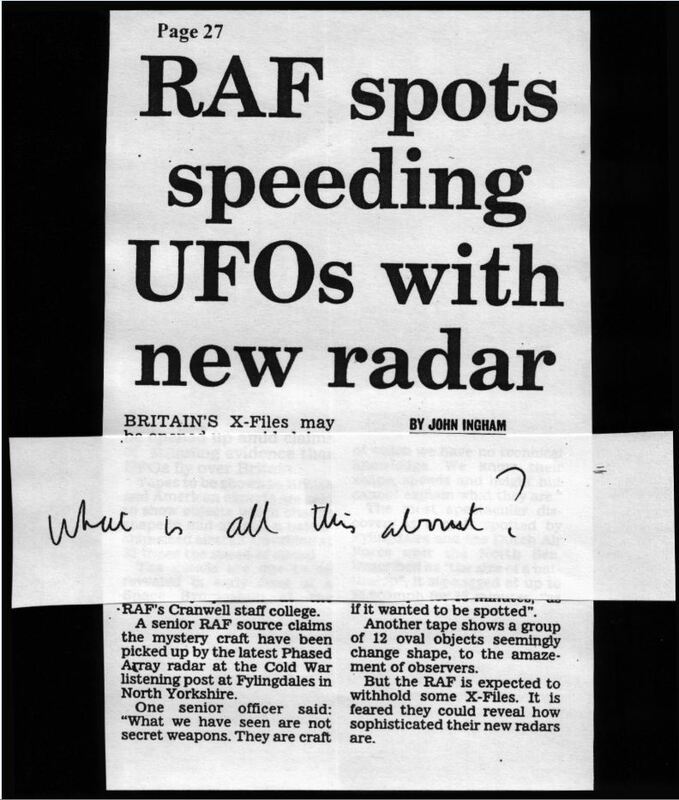 One of the best known stories in the UFO literature concerns unexplained phenomena that were recorded on British and American radars in the vicinity of RAF Lakenheath in Suffolk on 13/14 August 1956. For a more detailed account of this incident see my Case Files report here. Wimbledon said afterwards all those involved in the incident were quizzed by a senior officer from Fighter Command who stressed “absolute secrecy”. When I asked MoD to comment on Wimbledon’s story in 2001 they said an archive search had confirmed all records of this dramatic incident had been destroyed. The destruction of Air Ministry papers on the Lakenheath events was confirmed as long as ago as 1972 by the head of the MoD’s UFO desk, retired Air Commodore Anthony Davis, during a live studio debate on BBC 2’s Man Alive programme (DEFE 24/2031/1). What Davis did not reveal to the studio audience was that he was the pilot of one Venom involved. By an amazing turn of events he was airborne at the time in a night-fighter that was ordered to investigate the UFO by the RAF (presumably by Freddie Wimbledon’s interception team at RAF Neatishead). In MoD papers he describes being vectored towards the UFO by ground radar, but his navigator could not get a “lock on” and they ended up pursuing a “bright star”. This was probably the planet Venus that was a prominent celestial object at the time. Davis was the Commanding Officer of 23 Squadron whose Venom crews were at 24 hour readiness duties at RAF Waterbeach, near Cambridge. During the evening of 13/14 August several Venoms were scrambled to investigate UFOs seen on USAF radar in the vicinity of Lakenheath. But the squadron diary, which mentions the incident, says it was decided the “mysterious object” was possibly a stray meteorological balloon. When considering the possible explanations for this incident it is worth noting these files contain papers that deal with a more recent UFO incident involving aircraft from RAF Lakenheath, in January 2007 (DEFE 24/2076/1). In this case an unusual object was detected by the pilot of a USAF F-15 on his airborne radar during a routine exercise. The conversation between the crew and London military air traffic control that ensued was overheard by aircraft enthusiasts on the ground and soon the story reached UFOlogists. They suspected this was another case of aircraft scrambled to investigate UFOs on radar. The facts, revealed by the MoD file, are far less sensational. When the captain of the F-15 took closer look he found the “UFO” was actually the size of a soccer ball and was drifting in the wind at between 17-18,000 ft. Was this was a tiny spaceship full of miniature aliens? Or was it a weather balloon? Unsurprisingly the F-15 pilot felt a balloon was the more likely option. The UFO report files in this collection include details of a particular type of “sighting” that became common from around 2003. They describe formations of glowing, revolving orange lights that drift slowly across the night sky. These are most likely to be observations of Chinese lanterns, or mini hot-air balloons, often released at wedding parties and music festivals. One account from Herne Bay, Kent, filed in August 2006 describes eight yellow/orange spheres “that looked like they had flames coming out of the back of them”. Another from London describes hundreds of fireballs that were an “amazing” sight in the night sky. Chinese lanterns almost certainly explain a story that describes revolving lights spotted above the Pyramid Stage during the headlining performance by Radiohead at the Glastonbury festival on 28 June 2003 (for examples see DEFE 24/2035/1). Some UFO reports remain unidentified – but unidentified does not mean “extra-terrestrial”. One good example was the report submitted to the Civil Aviation Authority by pilot Ray Bowyer following a routine commercial flight from Southampton to Alderney, in the English Channel, on 23 April 2007 (DEFE 24/2081, pgs 39-47). He described seeing a long, cigar-shaped object – sparkling yellow in colour – hovering in the sky as the prop-driven plane approached Alderney in broad daylight. Bowyer estimated the size of this UFO as about that of a Boeing 737. This strange object was also seen by a number of passengers on the small plane who said it appeared to hover above the sea just 15 miles from the small aircraft. As they prepared for landing the pilot alerted Air Traffic Control in Jersey, who asked other pilots to look out for anything unusual (a second report was later filed by the pilot of a Jetstream aircraft who fleetingly saw a similar unusual object in the sky). As he was speaking to ground control, Bowyer spotted a second UFO, identical in shape to the first, that appeared to be further away. But the RAF said nothing was seen on Air Defence radars. They decided no further investigation was required, as the sightings occurred in French airspace. Again this unexplained sighting remains one of the more intriguing puzzles in the MoD’s X-files. Click here to download a pdf copy of a detailed study of the Alderney UFOs, by Jean-Francois Baure, David Clarke, Paul Fuller and Martin Shough, published by the Journal of Scientific Exploration in 2008 (vol 22/no 3). Why Can’t You Can Tell The People? The Rendlesham forest incident is possibly the best known cause celebre for the UK UFO community and is often called ‘Britain’s Roswell’. The MoD’s file on the incident was first released to me on 11 May 2001 following a request I submitted to MoD under the Code of Practice (a precursor to Freedom of Information) in February of that year. You can follow the original request and the response in the file, “Persistent Correspondent: Dr David Clarke” (DEFE 24/2031/1, pp 214-225). After the documents were sent to me, officials decided a copy should be sent to Lord Hill-Norton, the retired Chief of Defence staff who had become obsessed with UFOs in his retirement. At the time Nick Pope and Georgina Bruni dismissed my role in the disclosure of the file, attributing the release to the “tireless efforts” of Lord Hill-Norton. But the newly released files show this is untrue. A response to a FOI request on this issue states: “Lord Hill-Norton played no role in the release of these papers” (DEFE 24/2069/1, p.45). However, two files are devoted almost entirely to the MoD’s responses to more than 30 separate parliamentary questions tabled by Hill-Norton in the House of Lords from 1998. In 2001 one MoD official describes Hill-Norton as “pursuing this [campaign] with evangelical fervour” and notes that he was seen as “a champion of the case” by proponents of the extra-terrestrial hypothesis for UFOs. “a maverick…[suggesting] there was a deliberate attempt by MoD or MoD individuals to discredit him…[but] as far as I am aware, there was nothing more than a disagreement of views…but these words, to my mind, attempt to suggest a ‘cover-up’ and give more credence to Mr Pope’s views”. “Nick Pope…suggested to him that Georgina and himself could dress up as Mulder and Scully from the X-Files TV programme and have their photograph taken for Focus. It is interesting to note that in Nick Pope’s first book…he compares himself to Fox Mulder” (DEFE 24/2019, p350). Unhappy with the plan, the head of Sec(AS), Pope’s former branch, took advice from MoD Security. They said although the party was presented as a charity-funding raising event “it may be safe to surmise that the organisers have an alternative agenda which has the potential to cause embarrassment to the MoD”. Fearing they could be accused of “over-sensitivity or secrecy” if they refused to allow use of the cellar, MoD relented. But all the invited guests were issued with a leaflet making it clear the event was not endorsed by MoD. It was also agreed that Pope and Bruni would not dress up as “Mulder and Scully.” For good measure, a press briefing underlined the message that Pope was “not the Government advisor on UFOs”. “…our objection to publication stems from our discomfort over the promotion of someone who, in the words of AUS(CM) has ‘a long history of sailing close to the wind in using his official position to further his public interest in UFOs’”. Unsurprisingly, the MoD’s decision to scrap the Focus article on Nick Pope was the subject of yet another Parliamentary Question from Lord Hill-Norton, tabled on 4 May 2001. 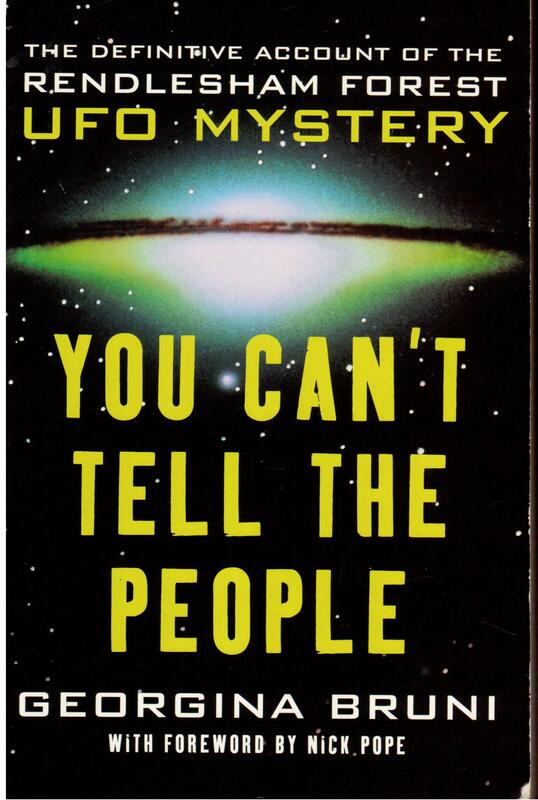 In a background briefing MoD admit that “in reaching their editorial decision officials were influenced against pursuing the UFO articles because on the one hand they felt they might give undue prominence to the claims of UFO enthusiasts” (DEFE 24/2034/1, p278-79). It appears we are never likely to get an adequate and open response to that question. A 2007 background brief on a request for access to background papers relating to Lord Hill-Norton’s Parliamentary Questions on UFOs, made under the Freedom of Information Act, recommends that “speculation contained in background notes as to the role and actions of Mr Pope” should be with-held under Data Protection Act [because] “he remains a figure of some contention within the UFOlogy community and his activities have been the subject of a number of FOI requests.” (DEFE 24/2094/1, p308-9). DEFE 24/2091/1 is undoubtedly the most interesting file as it shows how embarrassed the MoD actually were about Nick Pope’s decision to speak out on the UFO issue – and their determination to hide that embarrassment from the public. The file is interesting not because of what it actually contains, but simply because of the sheer amount of material that has been redacted, under the Data Protection Act (Section 40 of the FOIA). Section 40 is regularly invoked by government departments to deny legitimate requests for information on named individuals. In some cases this can be justified when that individual is a member of the public who wishes to protect their privacy. But the argument to with-hold information weakens when the individual is a civil servant whose official activities are funded by the tax-payer. However, because S40 is an “absolute exemption” it cannot be challenged, unless the consent of the data subject is obtained or there is a “compelling public interest” argument for disclosure . DEFE 24/2091/1 was opened following a request made by Andy Roberts under the Code of Practice (a precursor to FOIA) in February 2003. Andy requested access to papers surrounding clearance of Nick Pope’s 1996 book Open Skies Closed Minds: “…a copy of all and any files or correspondence which deals with Mr Pope and his book, which may have been generated by MoD…” This request was rejected on the grounds that the contents were exempt from release under Data Protection Act 1998. In addition MoD had a “duty of confidence” to protect correspondence with its employees. MoD told us that “personal data is so interwoven within the material that extraction would not be straightforward and would not leave a meaningful text” (letter from UFO desk officer Linda Unwin to Andy Roberts, 17 November 2003). In personal correspondence with me, Nick claimed the documents he wants to with-hold are private and “not part of the UFO files”. But the contents of this release demonstrate that is not the case. A number of the papers contain discussion of how MoD should react to Nick Pope’s media activities. These have been copied directly from UFO Policy and Parliamentary files, including DEFE 24/1958/1. They are public documents and these discussions took place in working time paid for by the tax-payer. I took this to mean all information – including that held on private researchers – should be released. Any information with-held will simply provide grist to the mill for those who wish to find evidence for conspiracies. Taking Nick at his word, in 2008 I asked the MoD to release all their correspondence with me and leave nothing uncensored except my private address (these files are DEFE 24/2030-2032). But evidently I was wrong. What he appears to mean was that all information should be released except that relating to Nick’s own “private” activities carried out in the media whilst paid by the public. How ironic that by the end of this disclosure programme the only documents MoD intends to permanently conceal concern their secret dealings not with aliens, but with a former member of their own staff. You can read a full account of my campaign to persuade MoD to release its secret files on Nick Pope on my blogger pages here.